Leonard Nimoy, beloved actor who is best known for his role as Mr. Spock, died today at the age of 83. He is of course world-renowned for his contributions to the Star Trek franchise, but he was a versatile actor, appearing in many movies, television series, and on Broadway. What I didn’t know was that he also had a Basque connection. This NPR story highlights how Nimoy, before he got his big break on Star Trek, was a journey-man actor, playing primarily ethnic roles. One of those roles was on the TV show Wagon Train, which follows a wagon train as it makes its way across the American West, from Missouri to California. In the 4th episode of season 3, entitled The Esteban Zamora Story, the plot deals with a trio of Basque sons, one of which is found dead with a knife. When their father joins them from the old country and learns of his son’s death, he is honor-bound, as are all Basques, to avenge his son. 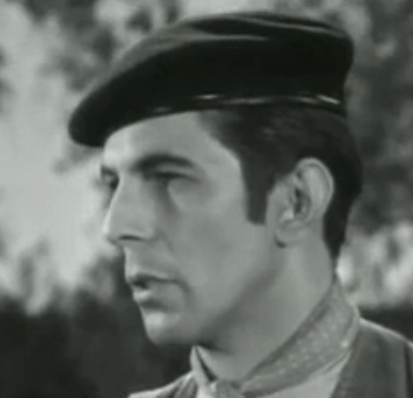 Leonard Nimoy plays one of the sons, Bernabe Zamora. Ernest Borgnine, that venerable veteran of film and TV, plays his dad, Esteban Zamora. This bit from the Basque media outlet EITB, playing on the resemblance between Mr. Spock and the previous Lehendakari of the Basque Country, Jose Ibarretxe, examines in detail the show’s interpretation of Basque culture, including the quite stunning outfit that Mr. Borgnine wears in honor of his home town. Scouting ahead of the train Flint discovers a young man bleeding to death from a stab wound and a knife nearby. He takes the body and knife to Sheriff Hixon who he knows. The Sheriff recognizes the body as that of the youngest Zamora brother who has a reputation as a trouble maker. His father Estaban Zamora, a Basque from Spain, is on the train planning to join his three sons in the new country herding sheep. The sons tell him a horse fell killing his son but Estaban quickly realizes they are lying. The Basque tradition requires the father to exact revenge for the killing of a son. Everyone including the sons want to prevent Estaban from following the tradition. As Esteban asks questions, he soon learns his youngest son was running with a group of sheep rustlers and the family name is smeared. The Sheriff tells Estaban there is little evidence showing him the knife Flint recovered. Estaban recognizes the knife as one he made for his sons and confronts the eldest son Manuel. His wife shows Estaban Manuel’s knife to protect her husband forcing Estaban to learn the painful truth. Thanks to Guillermo Zubiaga for translating “live long and prosper” to Euskara! Previous PostBerriak for February, 2015Next PostJaialdi is coming, are you ready?